As part of my interest in the history of singing bowls, I have looked at many photographs taken in Tibet from the late 1800’s to the 1940’s. I look for anything like a singing bowl also bells, cups and almost anything made out of metal. 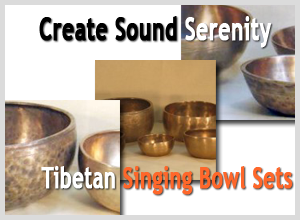 No photo is ever labeled one of a singing bowl as that is a modern term. Photos of any bowl are pretty hard to find; common and relatively plain objects are nowhere near as exciting as elaborate golden statues and consequently got much less photographic attention. The 1904 British expedition and subsequent diplomatic mission was the source of many beautiful photographs, some of which are reproduced on this website courtesy the British Library Board. The soldiers and especially the officers also brought back many artifacts. I had the chance to examine a singing bowl auctioned by Sotheby’s and authenticated as an expedition artifact. The bowl, a Jambati over a hundred years in the West, looks remarkably similar to some you see on this website. The above photograph is of a fruit and vegetable shop in Lhasa where you can see a number of bowls of different sizes mostly Manipuri style with a flanged Thadobati. Another Manipuri bowl, large, thick and lustrous but likely of bone is a small part of this photo of religious objects. The ultimate metal objects were iron bridges. Tibet was constructing iron suspension bridges centuries before they appeared in Europe. This early 20th century photo is of the remains of an iron suspension bridge constructed by Tangtong Gyalpo, a famous Buddhist master and bridge builder in the 15th century. Photos © the British Library Board and used by permission.